Guest post by Saurabh Vishnubhakat, Associate Professor at the Texas A&M University School of Law and the Texas A&M College of Engineering. Although Prof. Vishnubhakat was an advisor at the USPTO until June, 2015, his arguments here should not be imputed to the USPTO or to any other organization. This post is based on a paper for the Iowa Law Review symposium Administering Patent Law and is forthcoming in the Iowa Law Review. The full draft is available at at https://papers.ssrn.com/sol3/papers.cfm?abstract_id=3237841. It has now been four months since the Supreme Court decided SAS Institute v. Iancu, and it seems clear that ending partial institution will, indeed, be a significant disruption to the Patent Trial and Appeal Board’s administration of its docket. As I noted on this blog just after the decision came down, the power of partial institution was at the heart of PTAB case management from the beginning, and the requirement of binary institution from now on raises several important questions. In this post, I will offer some more detailed analysis of one of those issues in particular. That issue is how the Patent Office should understand the stakes of binary institution—which is to say, fully appreciate how much work partial institution was truly doing. Now that the PTAB must either fully grant or fully deny each petition that comes before it, the stakes of accepting versus rejecting a case largely point toward rejecting. The cases that were already being instituted in full or denied in full will be unaffected. The cases that were being partially instituted, however, will not be accepted lightly. Fully instituting such a case will necessarily bring significant obligations of deciding why arguments that the PTAB has already found likely to fail do, indeed, fail. On top of that, the PTAB must also explain fully enough, under the Chenery doctrine, why these arguments lack merit. Now that partial institution is unavailable, granting review will open the door to judicial scrutiny of the PTAB’s handling of the entire case, some or much of which will consist of arguments that the PTAB already had reason to think were not worth its time. This change generally counsels against full institution of close cases. On the other side of the agency’s choice is what effect a PTAB denial would have on the petitioner, for a denial would exclude meritorious arguments as well. In general, the harm would be minimal, as denying review creates no estoppel and so does not prejudice the petitioner’s ability to make the same arguments elsewhere. Under § 315(e), estoppel requires a final written decision under § 318(a), which applies only to a petition that has been “instituted and not dismissed.” As most petitioners (about 70%) are district-court defendants seeking PTAB review in response to an infringement lawsuit (what my coauthors and I have termed standard petitioners), invalidity arguments in the district court will remain available. The remaining petitioners (about 30%) who seek PTAB review preemptively would be similarly unharmed. It is true that they may or may not have Article III standing to seek declaratory relief in the courts, standing that they would not have to show in the PTAB. But they still remain free to refile their petitions in the PTAB itself, using the PTAB’s earlier denial of institution as a roadmap for filing a more successful petition. Because these nonstandard petitioners have, by definition, not been charged with infringement, the one-year time bar of § 315(b) does not apply to them. 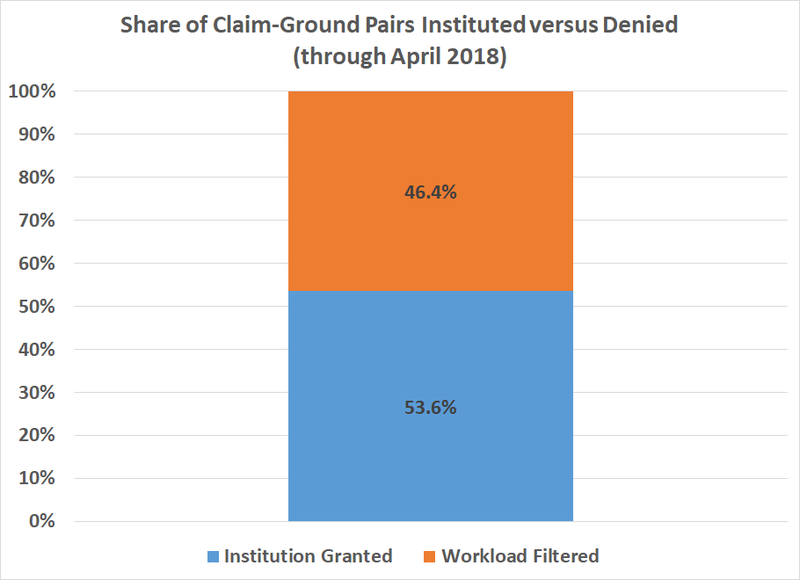 Thus, under the PTAB’s existing resource constraints, the burden of fully granting borderline petitions is generally higher, and the cost and prejudice on litigants inflicted by fully denying such petitions is relatively low, tilting on balance toward fully denying borderline petitions. The next question is whether this analysis in the abstract has real-world relevance to the PTAB’s likely incentives. The data strongly suggests that it does. Partial institution was doing much more work than previously appreciated to filter out unmeritorious arguments and focus the PTAB’s resources on challenges that were reasonably likely to succeed. The following two figures show why this has largely been overlooked. Through April 2018, when SAS Institute was decided, the respective shares of petitions that were fully instituted (39.2%), partially instituted (25.8%), and fully denied (35.0%) suggest that partial institutions accounted for only a minor part of the agency’s workload. 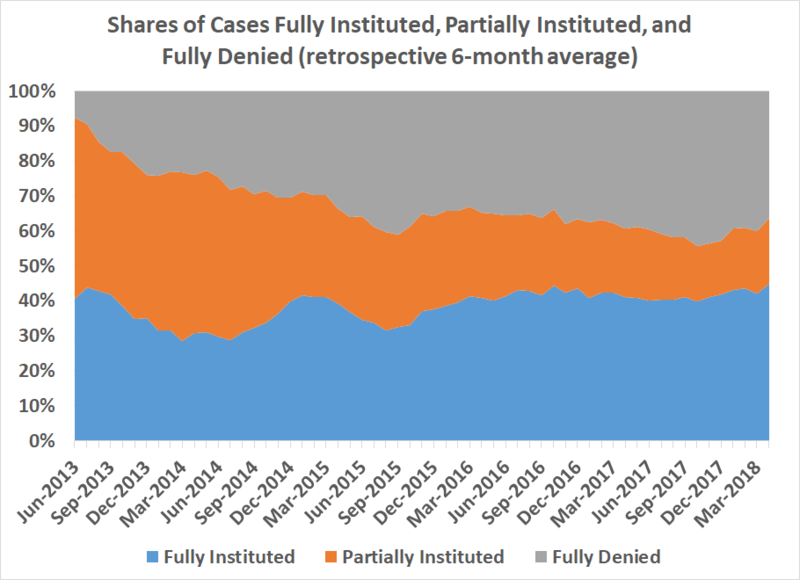 Indeed, the trends of these shares over time suggest that partial institution was diminishing even before the Supreme Court abolished the practice. But looking at petitions or cases as a whole misses the mark. The legal grounds asserted vary from petition to petition. An anticipation challenge generally relies on a single prior art reference rather than a combination of multiple references and so is less workload-intensive than an obviousness challenge. The patent claims that a petition actually challenges vary as well, and the workload burdens posed by different petitions vary accordingly. 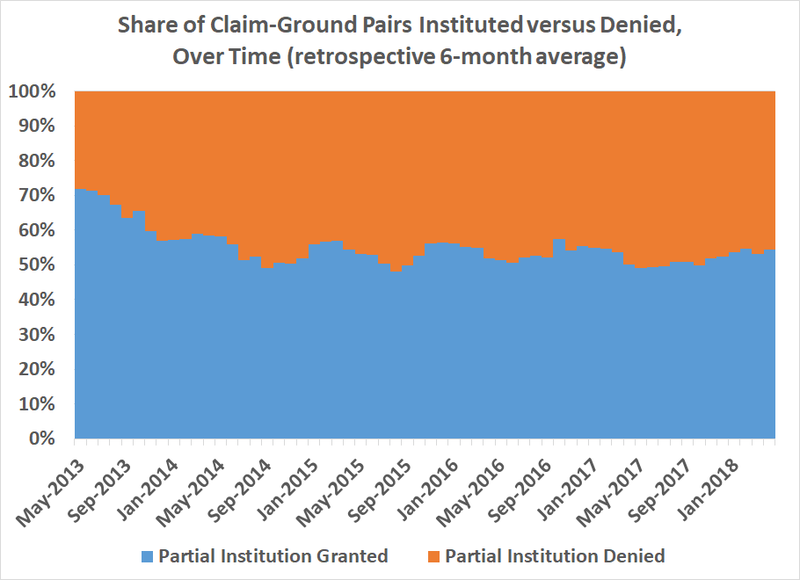 Taking these facts into account, the more granular and accurate measure of partial institution is the share of claim-ground pairs being challenged in the PTAB that were being granted, and the share that were being denied. As the next three figures reveal, this share has been both large and persistent. 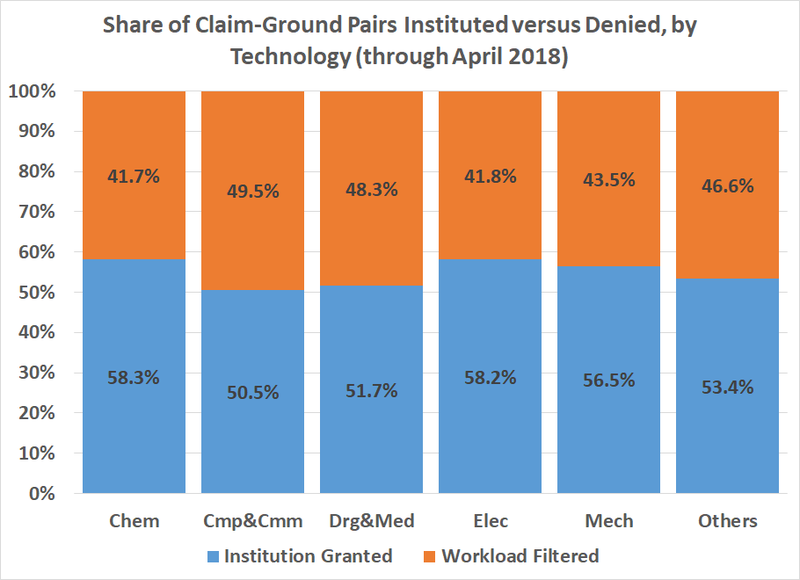 Through April 2018, the PTAB denied review of nearly half of all the claim-ground pairs that came before it in petitions. This finding is robust across technologies. It is also strikingly stable over time, starting at a rate of about 30% but quickly rising into the 40–50% range, where it has stayed for the past five years. This evaluation shows that partial institution was a substantial filter on the challenges that were admitted into administrative review. Confronted with the choice of full institution or full denial, therefore, the PTAB should think carefully about how much of a petition should present meritorious arguments before a panel is willing to take on the additional burden of adjudicating additional arguments that it already knows are likely to fail. If now faced with the Petition in the first instance, and understanding that we have only a “binary choice,” it may well be appropriate to deny the Petition in its entirety. But we have been instructed that the Office SAS Guidance is to be interpreted with the weight of Office policy as precluding termination of a partially instituted proceeding in response to SAS Institute. ESET LLC v. Finjan, Inc., IPR2017-01738, Paper No. 28 at 10 (Aug. 10, 2018). This exercise of agency discretion for transitional cases is entirely sensible as a policy matter. For cases where the PTAB has not only concluded that a patent is at least partly problematic but also invested resources to adjudicate those problems, terminating the proceeding would give the mistaken, but still potentially harmful, impression that the PTAB were actively abdicating its error-correction duties. In future cases, evaluating petitions in the first instance, the PTAB would be much better positioned to balance its obligations with its resource constraints within its broad discretion over institution. As I discuss further in the full paper, although the structural choices that lie ahead for the Patent Office are difficult, they are appropriate for the agency to have to make. The policy judgments that are most rational for the Patent Office to reach in light of SAS Institute are likely to promote reasoned decision-making by the agency as well as more efficient substitution of administrative adjudication for judicial review. These policy judgments, in turn, will also bring important questions—including the one-year time bar and the issuance of stays pending PTAB review—back to the Federal Circuit. These questions are a valuable chance for the Federal Circuit to reconsider panel decisions that have largely been overtaken both by its own recent en banc decisions and by the Supreme Court.